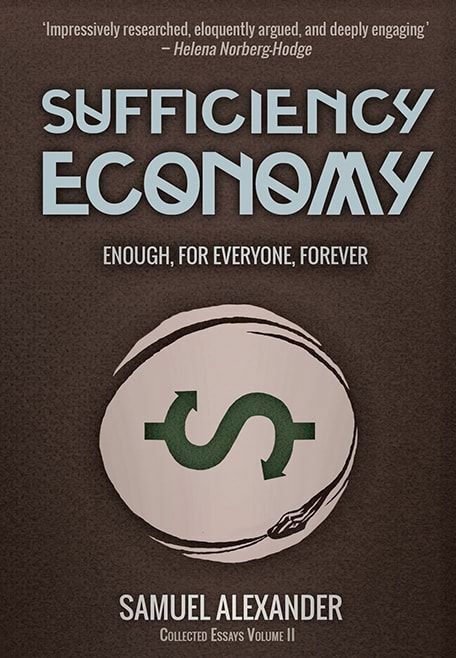 "Sufficiency Economy" is the second volume of collected essays from Samuel Alexander, co-director of the Simplicity Institute. In this second volume of collected essays, Samuel Alexander develops the provocative ideas contained in 'Prosperous Descent: Crisis as Opportunity in an Age of Limits'. Given that the global economy in in gross ecological overshoot, Alexander argues that the richest nations need to transcend consumer culture and initiate a 'degrowth' process of planned economic contraction. To achieve this, he shows that we need to build a post-capitalist politics and economics from the grassroots up, restructuring our societies to promote a far 'simpler' conceptions of the good life, based on notions of sufficiency, frugality, appropriate technology, and localism. "With the vision of a prophet, the eloquence of a poet, the forensic detail of the scholar, and the engaged passion of an activist Sam Alexander offers critique, analysis and strategy for a post-growth society beyond carbon-fuelled, consumer capitalism." "Impressively researched, eloquently argued, and deeply engaging, Samuel Alexander’s work lies at the forefront of the degrowth movement. More than just a powerful critique of the capitalist growth economy, this book highlights the promise – and the necessity – of localised, ecological economies as the only means of adequately confronting the crises that are converging upon us. At times his vision of the future may be challenging, but it is never despairing, and ultimately the reader comes away uplifted and inspired. Alexander convinces us that less can indeed be more." - Helena Norberg-Hodge, author of "Ancient Futures" and producer of "The Economics of Happiness"
"Sufficiency Economy is a fascinating and encompassing work that envisions an affirmative response to the descent of growth-driven societies. It prospects a way forward that is neither overly optimistic, nor bleak. The result is a strategy for transitioning to a steady-state yet vibrant existence that focuses as much on ensuring human dignity as on ending our planetary overconsumption." - Raymond De Young , co-author of "The Localization Reader: Adapting to the Coming Downshift"